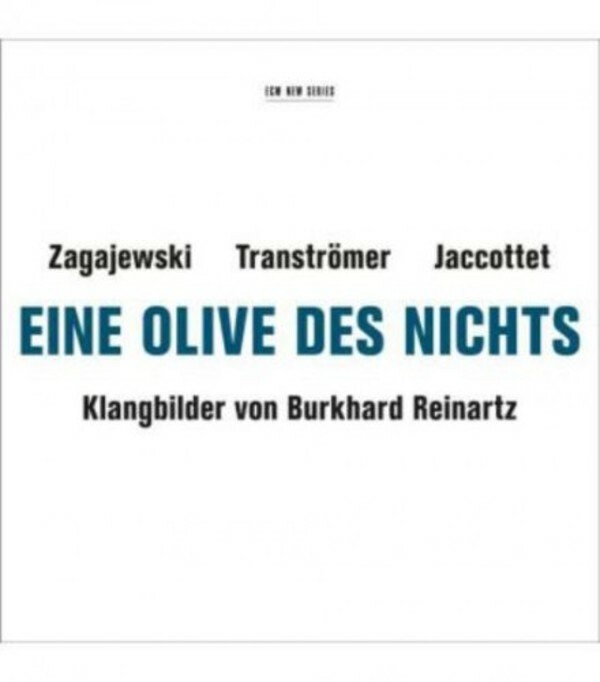 For ’Eine Olive des Nichts’ (An Olive of Nothingness), the Cologne-based radio author and director Burkhard Reinartz blends poems and texts by poets Tomas Tranströmer, Adam Zagajewski and Philippe Jaccottet with noises, soundscapes, and music by a wide range of ECM composers and artists into a unique amalgamation. Within the stream of sounds the poets circle around the subject of what poetry means to them, in minimalistic statements. A listening space emerges with a naturalness and freshness that frees the interplay of words and music from the stiltedness of more conventional poetry settings. The Swedish poet Tomas Tranströmer won the 2011 Nobel Prize for Literature, Adam Zagajewski is Poland’s greatest living poet while Philip Jaccottet is one of the most prominent figures among the immediate post-war generation of French poets. Their words are spoken in German by Anja Lais, Bruno Winzen and Burkhard Reinartz. The music - spanning classical, jazz and improvised music - is by Eivind Aarset, Jon Balke, Nik Bärtsch, Meredith Monk, Tomasz Stanko, Arvo Pärt, Morton Feldman and others, among them Susanne Abbuehl, Wolfert Brederode Quartet, Ketil Bjørnstad, David Darling, Mathias Eick, Sidsel Endresen, Food, Paul Giger, Arve Henriksen, Benedict Jahnel Trio, Trygve Seim, Steve Tibbetts, Bobo Stenson Trio, Tarkovsky Quartet, Stevan Kovacs Tickmayer, and the Christian Wallumrød Ensemble.